The beginning of May was characterized by rather low temperature. Especially night temperature oscillated lightly above 0°C and two times even fell under zero. During the first half of May there was enough moisture remaining from April. Furthermore nearly all the May precipitation came in the first half of the month. On the contrary the second half of May was characterized by very warm and dry weather. That was the reason why despite the April rich in precipitation, the rainfall deficit begins to appear in the whole Saaz area. 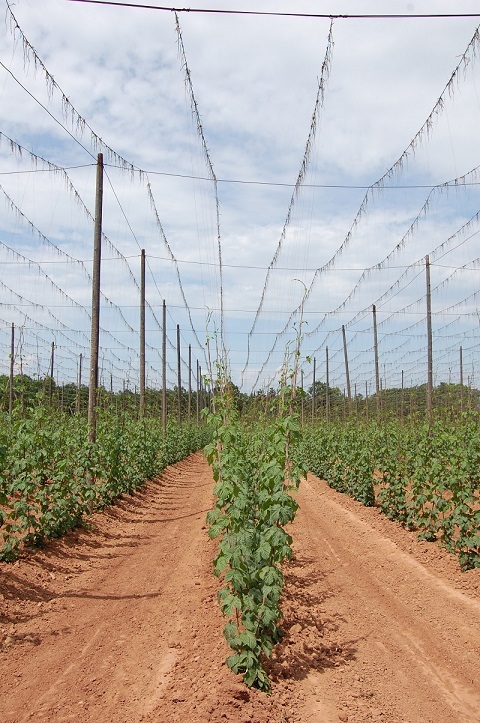 Hop training started at the second half of May and majority of farmers finished it by the end of the month. Currently the fertilization, cultivation and first hilling is going on. The health state of the hops is very good and hop plants reach now the height of 2,5 ? 3 m. The first chemical treatment against downy mildew of hops was already done on all the hop-gardens. Infection risk of this disease is not too high due to the dry weather. Hop aphids appeared on hop plants during the last week of May. Its presence in several localities was so strong that the chemical treatment had to be done as well. According to the occurence of hop aphids probably the spraying will have to be applied in all the areas in June. The spring generation of flea beetle occured in fact on all the hop-gardens. The majority of hop-gardens was treated against this pest as well.